Home » Financial Advisor Boise ID » Is a Health Savings Account for You? Posted by Peggy Farnworth on Nov 15, 2018 in Financial Advisor Boise ID, Financial Planner Boise ID | Comments Off on Is a Health Savings Account for You? Health Savings Account are growing in popularity. It is not surprising since HSAs have triple tax benefits. Withdrawals for medical expenses are tax free. In addition, there are no required distributions like you have with IRAs. Also, there are no income limits for contributing to an HSA like you have with a ROTH. The 2017 Devenir HSA Research Report shows the number of HSAs have grown to 22 million since their start 15 years ago. These accounts hold over $45 billion in assets. Many are using HSAs as a retirement healthcare Kitty. Fidelity study shows the cost of healthcare for a 65 year old couple in retirement to be $275,000. This includes health care premiums and out of pocket expenses. 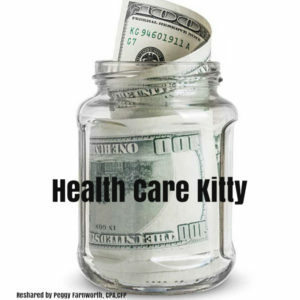 Costs that can be covered by an HSA healthcare kitty. Yet 1 in 5 HSA owners are making a mistake. They are not contributing to their HSA. A minimum contribution would be the $1,350+ deductible for your insurance. An alternative would be to contribute monies to cover your current medical expenses. Then turn around and pay your medical bill from your HSA. The 2019 guidelines for HSA contributions is $3,500 for singles and $7,000 for families. If you are over 55, you can contribute an additional $1,000. However, be aware that in 2019 the contribution your employer makes to your HSA, reduces the amount you can contribute. For example, you have a family HSA and your employer contributes $500 to your account. Your maximum contribution is $6,500 ($7,000 family limit less $500). Once you are on Medicare, you can no longer contribute to an HSA. If you are 65+ and on your employer’s health coverage, you can delay enrolling in Medicare. Even enrolling in the free Part A-hospital coverage with Medicare, will disqualify you for making HSA contributions. Health Savings accounts allow you to name a beneficiary. A spousal beneficiary is allowed to rollover the account and make it their own. A non-spouse beneficiary cannot. They must disburse the account in the year the owner dies. This disbursement is taxable. Preserving an HSA for a non-spouse beneficiary is handing them a tax problem. Retirement accounts allow the beneficiary to stretch the disbursement over their lifetime. This is the better account to leave an heir. Use your HSA on your medical expenses. An HSA has many benefits – use them wisely!